I was wondering if anyone knows where the border fences that are intended to block the influx of illegal immigrants from Mexico & Central America are located? If anyone could provide a map with the details I'd be very appreciative. In addition, does anyone have any information regarding where future border fences are already being constructed or have planned to be constructed? 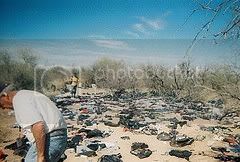 I happen to have become a very concerned US citizen after seeing the negative effects of illegal immigration but I have little knowledge of any events regarding the construction of border fences. I don't plan on using any information provided to assist illegal aliens in circumventing the law but rather I'd like to have some sense of security knowing that there are border fences constructed. One I've personally seen is going up in the canyon called smuggler's gulch. I wonder how it got that name. I don't know...using criminal illegals to build the fence might be a darned good idea Californio. Bring back the chain gangs now!!! It's being erected in sections all along the border. I'm guessing the plan is that they start at one site and work their way toward another section of the fence. I've seen sections driving along the border and it really is a quite hideous scar across my beautiful desert landscape. I wonder how long it'll be until there are gaping holes throughout. That's because they're building another corregated fence. In a episode of Penn & Teller's BS they hired some illegals to build a fence and then go through it. It took them 5 minutes to go through the fence, 5:30 to go under the fence, and a little over 10 minutes to jump it. "Where are the border fences constructed/being constructed?" That's actually a valid point, as some of these unfortunate landowners have to deal with the mess that is left. 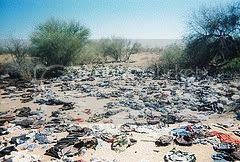 As border cities like mine have beefed up their protection, illegals have moved further and further into remote locations like rural Arizona to cross. 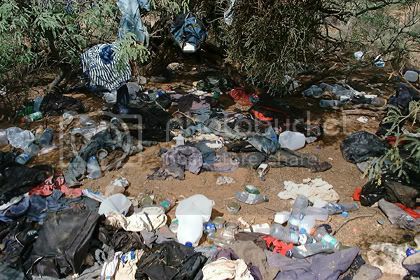 As a result it is a more dangerous and lengthy journey, thus all of that trash left behind. Its a tough problem to solve, and view anybody who offers up an easy solution with suspicion. Well -- one thing liberals and the open borders proponents don't realize is that there were already fences, they are just extending them and making them better. Silvestre Reyes himself had some of the fences put up before he sold out and became the puppet of the Mexican government. I see the fence daily. At least some of it is going up in a place that is very dangerous and it will save lives. Fewer people will try which means fewer deaths out there.